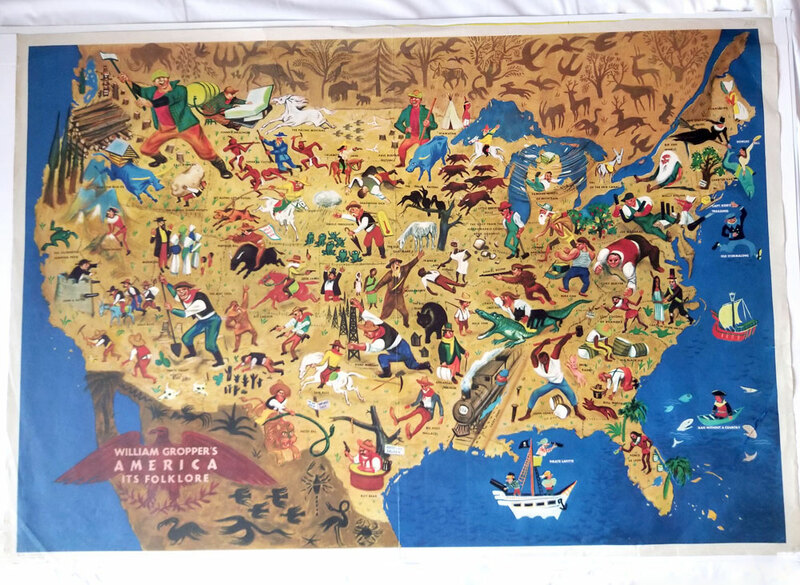 William Gropper's America, its folklore, 1946 by William Gropper, original. 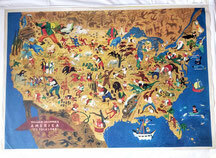 Color historical pictorial map of the United States. It was created to showcase the diversity of national myths and folk stories and shows characters and names or titles from American folklore, original. Карта США "Америка – это фольклор", созданная в 1946 году ньюйоркским художником Уильямом Группером, оригинал. Историческая цветная карта США была создана с целью продемонстрировать разнообразие культуры страны, обозначить легендарные персонажи из популярной истории и мифологии. Separately issued pictorial Map of New Jersey showing places of historical significance, roads, railways, airports, canals, towns, and beaches. Pictorial illustrations represent various places, such as revolutionary soldiers tending a cannon at Monmouth Battlefield, and sunbathers with umbrellas at the beaches. Pictorial illustrations of agricultural products, including tomatoes and grapes. Border decorated with important historical events and famous people such as Thomas Edison in his lab at Menlo Park and Princeton, where "Confederates defeated Union forces - 1862." Waters decorated with boats, including tuna fishermen. Simple green border, map in tones of cream and blue, with some additional subdued coloration. Карта включает изображения достопримечательностей, а также дорог, аэропортов, каналов, водопадов и пляжей. Основные события прошлого штата топографически представлены в миниатюрных рисунках, в том числе сведения об известных людях, таких как Томас Эдисон и его лаборатории в Менло-парке и Принстоне, места знаменитых сражений во время войны за независимость и во время Гражданской войны. На карте обозначены виды хозяйственной деятельности и особенности развития экономики. 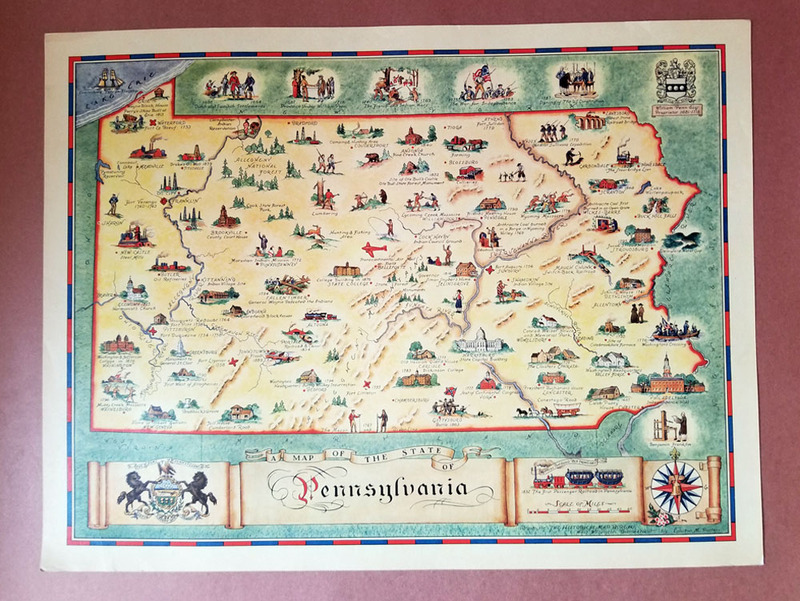 Color pictographic and pictorial Historical Map of Pennsylvania showing places of roads, railways, airports, canals, towns, falls and beaches. Illustrations represent various points, such as Indian Village sites, monuments of revolutionary period and Civil War. Border decorated with information about: The Caleb Pusey House, built in 1683 and Schnitz House in the Bethlehem Moravian Community, built in 1741, home of senator Albert Gallatin in New Geneva, Benjamin Franklin printing machine and much more. 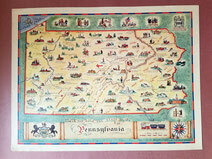 Simple green border, map in tones of cream and blue, with some a Most attractive pictographic map in an antique vein, with arms of Pennsylvania at lower left and compass rose at lower right; vignettes and pictographs of places and events. A most decorative piece. 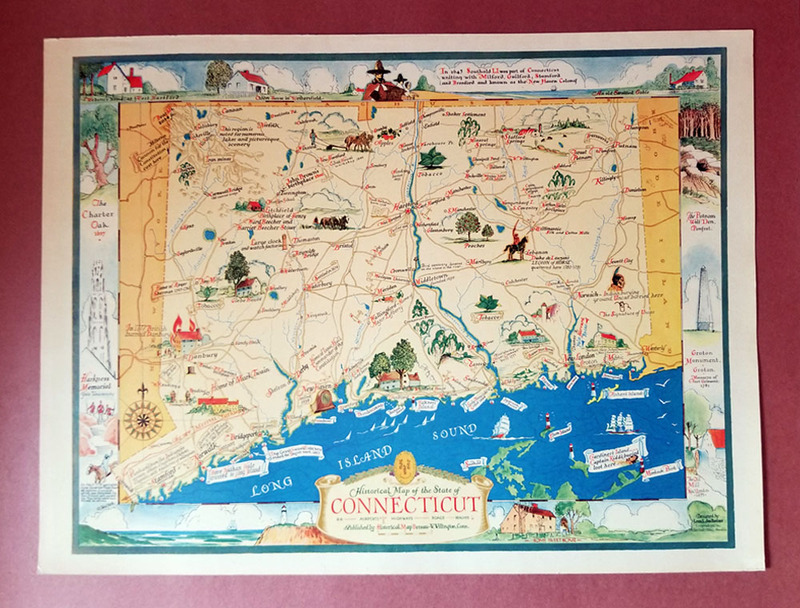 Separately issued pictorial Map of Connecticut showing places of historical significance, roads, railways, airports, canals, towns, and beaches. Illustrations represent various places, such as revolutionary period and Civil War. Pictorial illustrations of agricultural, vine and meat and dairy products. Border decorated with information about famous people such as birthplace American abolitionist John Brown, Harkness Memorial Yale University, Home of Mark Twain and etc. Waters decorated with boats, including tuna fishermen. 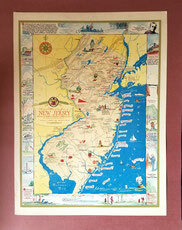 Simple green border, map in tones of cream and blue, with some additional subdued coloration. Карта включает изображения достопримечательностей, а также дорог, аэропортов, каналов, водопадов и пляжей. Основные события прошлого штата топографически представлены в миниатюрных рисунках, в том числе сведения об известных людях: место рождения прославленного аболюциониста Джона Брауна, дом Марка Твена (ныне музей), места индейской истории, отмечены артефакты времен войны за независимость и Гражданской войны. На карте указаны виды хозяйственной деятельности: овощные, винные фабрики, табачные плантации, охотничьи угодия, оружейные заводы и машино-строительные компании. 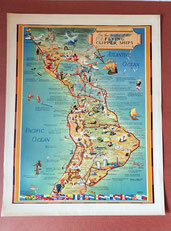 Pictorial promotional map showing the area from San Francisco to a little south of Buenos Aires, advertising Pan-American Airlines air service throughout the Americas. Shows pictographs indicating tourist attractions, agriculture, wildlife, mines, etc. Relief shown pictorially. Includes an overview of the history and the importance of the major cities in Central America, South America and the Caribbean. The flags of the nations of the Americas appear along the bottom of the map. 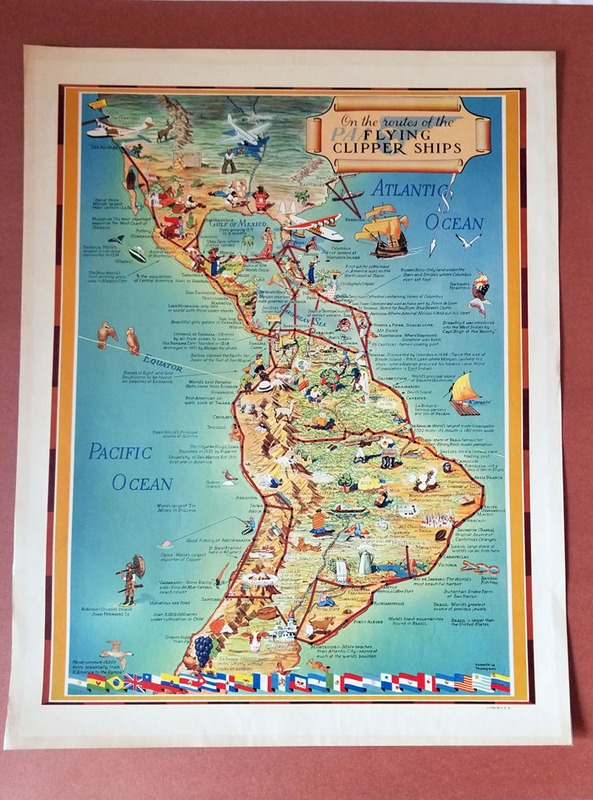 For your information: the flying clipper ship routes were flown from 1931 to 1946. 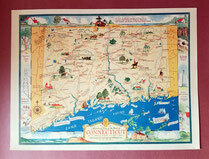 A most interesting as a document of the era and decorative piece.